Chief Operating Officer of Oceanic Mike Hollis, Founder and Chief Executive Officer of Oceanic Bob Hollis, PADI Tec Consultant Jeff Loflin and President of Hollis Gear Nick Hollis spent three days in Puerto Aventuras test diving Hollis’ sidemount gear. Bob Hollis is an influential dive industry pioneer and has been diving since the 1950s. Pictured [L-R] Mike Hollis, Jeff Loflin and Bob Hollis. Happy to see that the Hollis Team get some time away from the office and get to dive the great products they are manufacturing :-). 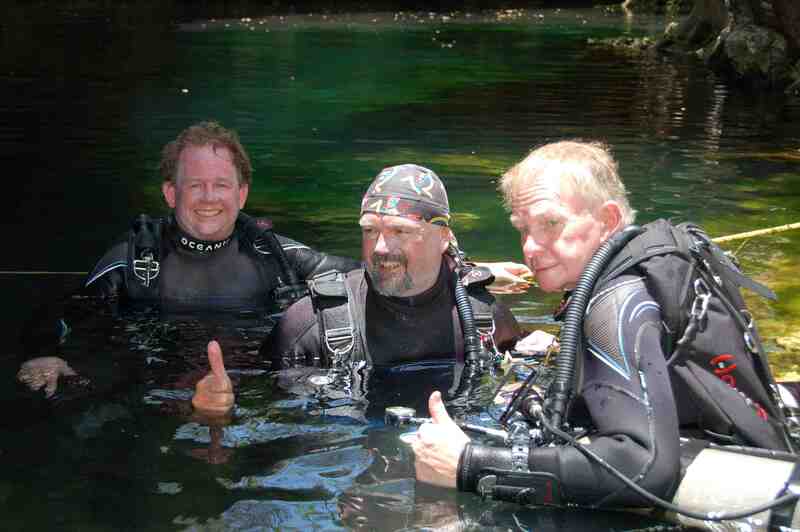 We been diving and teaching Sidemount using the Hollis SMS100 (Sidemount System) for a year now and we really like it. It is truly a multi-purpose Sidemount unit which you can use when diving both recreational and technical sidemount. The unit can also easily be “stripped” so you can use the wing when diving backmount (I recommend you to use a conventional harness and backplate which is bit stronger when using the SMS100 wing for backmount). However if you looking for a Sidemount unit that you want to use for penetration dives – then go for the Hollis SM50 (Sidemount only) instead which is made for that purpose specifically. Just one thing that i did not like about the SMS100 when we got ours was the fact that it came with “suicide clips” – i strongly suggest you change those to the standard single ender clips we use for deco tanks.